The Jets and Jacob Trouba weren’t able to work out an agreement on a contract and wound up going through salary arbitration with him being awarded $5.5MM. The defenseman told Postmedia’s Ken Wiebe that he’s hopeful to avoid going that route next offseason and indicated that he remains open to signing a long-term pact with the team, acknowledging that there were long-term deals discussed over the summer. Winnipeg has several players in the final year of their contract including fellow blueliner Tyler Myers plus wingers Patrik Laine and Kyle Connor and already has nearly $52.5MM committed to just 11 players for 2019-20. While Winnipeg may certainly be interested in giving Trouba a long-term contract, they may not be able to afford to do so without clearing out someone else to create the cap space. Minnesota may be without winger Luke Kunin to start the season. Speaking with reporters, including Dane Mizutani of the Pioneer Press, he noted that he has not been cleared for contact from the ACL surgery he underwent back in early April. He’s slated to be re-evaluated in early October but even if he gets the green light, he may not be ready for the opener. The 20-year-old split the season between the Wild and their AHL affiliate in Iowa; he had two goals and two assists in 19 NHL games plus ten goals and nine helpers in 36 minor league contests. Predators defenseman Roman Josi has switched agencies, reports Sportsnet’s Elliotte Friedman. After previously being with Maloney & Thompson Sports Management, he has joined Wasserman/Orr Hockey. Despite the switch, it will still be a little while before the blueliner can negotiate a new contract as he’s ineligible for a contract extension until July 1st. At that time, Josi will certainly be looking for a significant increase on his current $4MM cap hit. Roman Josi couldn’t drag the Nashville Predators or Switzerland to victory this year, but it wasn’t for a lack of effort. 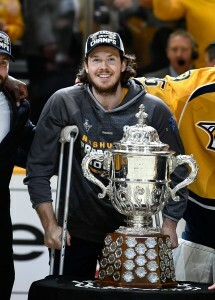 As reported in swisshockeynews.ch today, Josi broke his hand in the IIHF World Championship semi-final game against Canada, but still suited up in the final for nearly 30 minutes of ice time. 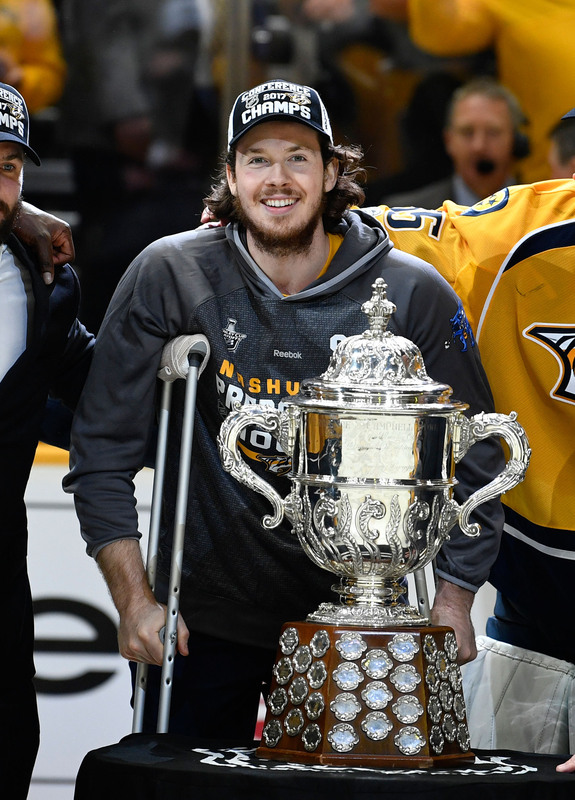 Apparently the Swiss team needed to get permission from the Predators to have him continue to play, likely meaning it’s not a serious injury for the Nashville captain. Josi will be expected to log big minutes once again for the Predators next season as he continues to close in on the end of his current contract. The 28-year old defenseman is scheduled to become an unrestricted free agent in the summer of 2020, meaning an extension from GM David Poile and the team just over a year from now seems like almost a sure thing. Josi will carry a cap hit of just $4MM this season and next, another one of the Predators’ mind-boggling bargains on the back end. He, Mattias Ekholm and Ryan Ellis combine for just a $10.25MM cap hit and are among the best at their position—broken hand and all. The Bakersfield Condors have hired Dave Manson as an assistant coach for next season, joining the Edmonton Oilers’ AHL affiliate and head coach Jay Woodcroft. Manson, former NHL player and father of Anaheim Ducks’ defenseman Josh Manson, had been coaching with the Prince Albert Raiders since his retirement in 2002. The Condors will try to get back to the playoffs next season, after finishing just 31-27-10 in 2017-18. Michal Kempny has been a huge part of the Washington Capitals success since coming over from the Chicago Blackhawks during the season, but even he wasn’t expecting to have such an impact. In fact, according to Frank Seravalli of TSN, Kempny was considering returning to Europe at some point as he doubted his future in the NHL. The 27-year old shouldn’t have to worry about that any longer, as he’s done enough to earn a contract offer from the Capitals at very least, and likely many more suitors on the open market should he decide to test unrestricted free agency this summer. The doctor says it’s about confidence now, he’s fully healed. 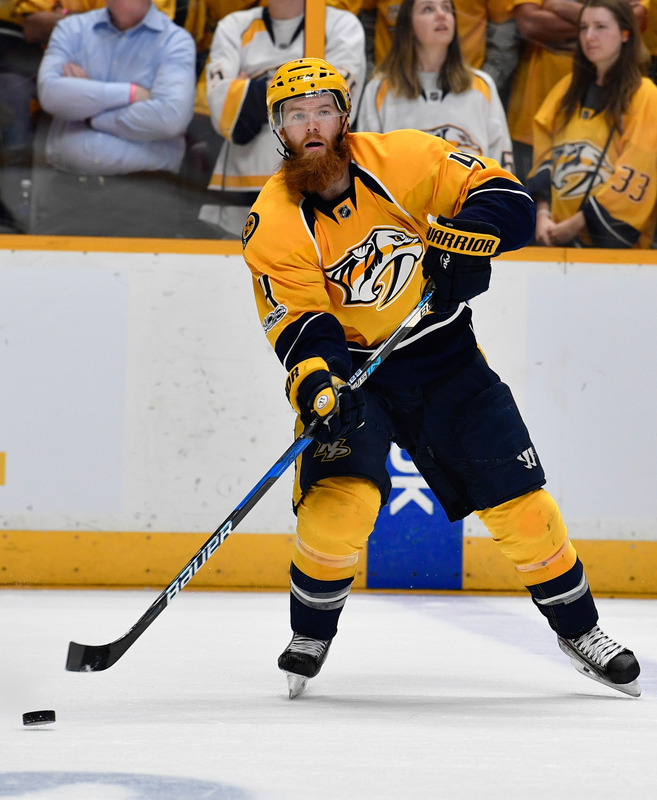 I’m expecting Ryan Ellis will skate the last week of the year and be looking at the first game of 2018 as a time to be back. Ellis has turned himself into one of the premier defensemen in the league, scoring 16 goals and 38 points last season while being responsible in his own end every night. The 26-year old was named “associate captain” of the Predators in the offseason, after Roman Josi—who was eventually named team captain—suggested Ellis without hesitation for the job. His return will likely feel like that of a huge trade deadline acquisition, especially if he can get back to the level he played at last season. In the past, the Predators have leaned heavily on their top two pairings to log nearly the whole game and with Ellis’ return they can again. With Alexei Emelin now in the mix they can afford to ease Ellis back in, but it shouldn’t be long until he’s back playing somewhere near the 24 minutes a night he averaged last season. That makes the Nashville defense corps almost unmatched around the league, and will give them another advantage over the rest of the Western Conference. After a turnaround sparked by the acquisition of Kyle Turris, the Predators are a team on the rise and can be considered a legitimate Stanley Cup contender once again.